Everything was handmade at community workshops using papier mache, fabrics, felt, card, glitter and trims. The variety of decoration on the cups and saucers was amazing and each cup was filled with tea and completed with silver spoons and biscuits on the saucers. We also had cute little coffee mugs filled with frothy cappucinno and the felt mince pies, slices of Christmas cake, and cup cakes looked good enough to eat! 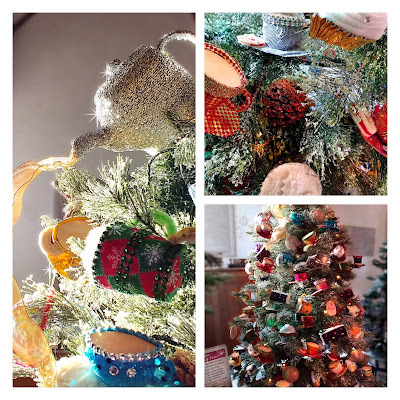 The tree was topped by a sparkly Tea pot pouring tea. Donations received from visitors to the festival will go to the Wellow Literary Institute.